Background: Manual reduction or traditional steel plate fixation is commonly used for repair of proximal humerus factures in older patients, making these injuries prone to fracture malunion because of poor stability. While open reduction with steel plate fixation has a better outcome than closed reduction, the stability of internal fixation is still less than satisfactory. Therefore, we hypothesize that use of a locking compression plate will provide better stability and that biocompatibility will potentiate fracture healing and shoulder function recovery in older patients with proximal humerus fractures. This hypothesis is based on the fact that minimally invasive treatment with locking compression plates has presented good clinical results in terms of fixation stability, bone healing, and functional recovery. 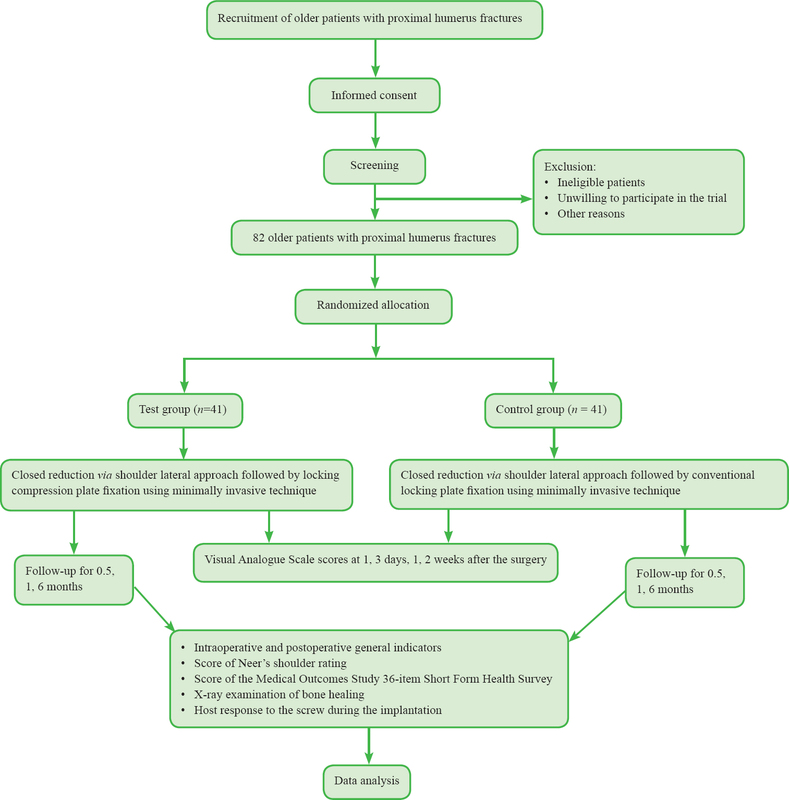 Methods/Design: This prospective, single-center, randomized controlled clinical trial will be completed at the Department of Joint Surgery, Affiliated Hospital of Qinghai University in China. Eighty-two older patients with proximal humerus fractures will be enrolled and equivalently assigned to two groups. In the test group, patients will undergo closed reduction via a lateral approach to the shoulder followed by locking compression plate fixation using a minimally invasive technique, and those in the control group will be subjected to closed reduction via a lateral approach to the shoulder followed by conventional steel plate fixation using a minimally invasive technique. All patients will be followed up for 6 months. The primary outcome will be recovery of shoulder function as indicated by clinical outcome scores according to the Neer classification system for proximal humeral fractures 6 months after surgery. 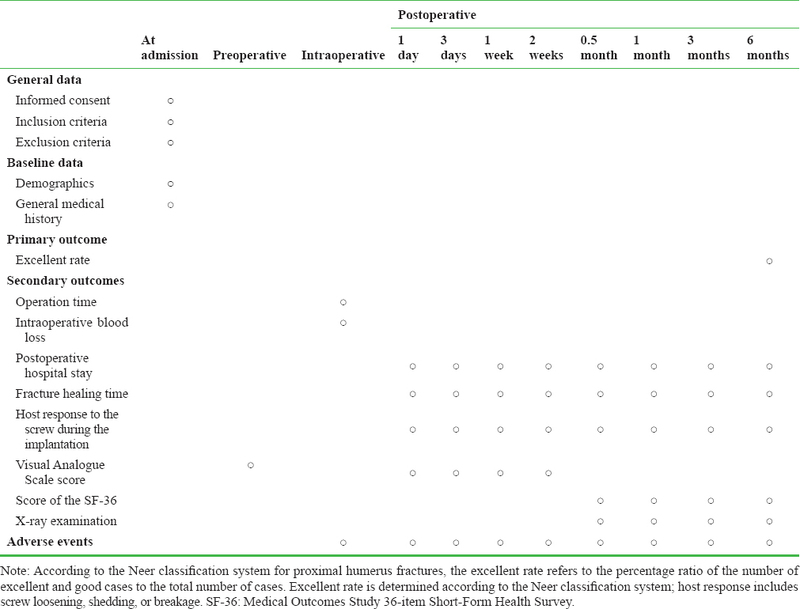 The secondary outcomes will include the operation time; intraoperative blood loss; postoperative hospital stay; fracture healing time; clinical outcome scores according to the Neer classification system 0.5, 1, and 3 months after surgery; Visual Analogue Scale scores 1 and 3 days and 1 and 2 weeks after surgery to assess pain; scores of the Medical Outcomes Study 36-item Short Form Health Survey 0.5, 1, 3, and 6 months after surgery to assess quality of life; and X-ray examinations 0.5, 1, 3, and 6 months after surgery to assess fracture healing. Discussion: This study protocol represents an attempt to objectively choose appropriate methods for internal fixation of proximal humerus fractures in older patients by comparing locking compression plate with conventional steel plate fixation to improve shoulder function. Trial registration: ClinicalTrial.gov identifier: NCT02784522. Ethics: This study acquired written approval from the Ethics Committee of the Affiliated Hospital of Qinghai University in China (approval No. QHY1005D); this study will be performed in accordance with the guidelines of the Declaration of Helsinki, formulated by the World Medical Association. Treatment for proximal humerus fractures emphasizes the restoration of shoulder function (Handoll and Brorson, 2015; Qu et al., 2015; Thayer et al., 2015; Zhao, 2015; Solarz et al., 2016). Older patients, because of the loss of bodily functions, face enormous difficulties in fracture healing and shoulder functional recovery after sustaining proximal humerus fractures (Den Hartog et al., 2011). As previously reported (Ma, 2011), open reduction with conventional locking plate fixation achieved fair outcomes in 48 cases of proximal humerus fractures in older patients, with an excellent rate of 85.4% according to the Neer classification system. Our clinical experience, however, has shown that the stability of internal fixation is inadequate and must be enhanced. Consequently, we design a microsurgical implantation using a locking compression plate (LCP) to treat proximal humerus fractures in older patients. In a search of the Web of Science database, we found a randomized controlled trial reported by Wang et al. (2012) in which LCP fixation using microsurgical techniques had better outcomes in 20 cases of proximal humerus fractures in older patients. However, the limitation created by the small sample size had profound effects on the reliability of their study. No relevant articles were retrieved from the Chinese Clinical Trial Register, and only one similar article was found on ClinicalTrials.gov: "Proximal Humerus Fractures: Randomized Study Between Locking Nails and Locking Plates for Neer 2 and 3 Parts" (identifier: NCT01984112). In this clinical trial, Constant-Murley scores were considered the primary outcome, and the follow-up period was 12 months. Importantly, the inclusion criteria and study arms were distinctly different from those in our study protocol. The main principle of minimally invasive techniques in orthopedics is to implant a specific bony plate, which is fixed across a transverse fracture, via small incisions of the periosteum, skin, and muscle (Biscević et al., 2009). These implantation devices include less invasive stabilization systems, dynamic compression plate systems, and LCP systems. Internal fixation with the LCP system involves two completely different fixation techniques and two opposing osteosynthesis principles, namely conventional plate and bridging plate osteosyntheses characterized by direct anatomical reduction. Because of its special design, the LCP can be used as a dynamic compression plate, as a pure internal fixator using locking head screws, or as both combined, thus providing a variety of therapeutic options for surgeons (Niemeyer and Südkamp, 2006; Fan et al., 2015). Moreover, the LCP has good stability and induces less damage to the periosteum; it is therefore beneficial for bone healing and functional recovery (Pichon et al., 2008; Nakahara et al., 2010; Handoll and Brorson, 2015). Given these characteristics, the LCP is likely to have stronger stability than the conventional locking plate for internal fixation of fractures. Therefore, we design a study protocol that compares the LCP and conventional locking plate using minimally invasive techniques for internal fixation of proximal humerus fractures in older patients. We hypothesize that the LCP will be more effective than the conventional locking plate in promoting shoulder function recovery with a higher excellent rate according to the Neer classification system for proximal humerus fractures. This prospective, single-center, randomized controlled clinical trial will be completed at the Affiliated Hospital of Qinghai University, Xining, China. According to a random number table, 82 older patients with proximal humerus fractures from the Affiliated Hospital of Qinghai University will be assigned to two groups: closed reduction via a lateral approach to the shoulder followed by LCP fixation or conventional locking plate fixation using a minimally invasive technique. All patients will be followed up for 0.5, 1, 3, and 6 months to compare the effects of these two kinds of locking plates on fracture healing and recovery of shoulder function. Eighty-two older patients with proximal humerus fractures hospitalized at the Affiliated Hospital of Qinghai University will be recruited for the trial. The diagnosis of proximal humerus fractures will be confirmed as noted in previous studies (Hu et al., 2016). PASS 14.0 software (NCS, Kaysville, UT, USA) will be employed for the sample size calculation in this trial, and the excellent rate according to the Neer classification system is hypothesized to reach up to 95% in the test group and up to 85% in the control group. With a β of ≤ 0.1, a power of 90% (β = 0.10), and an α of 0.025 (bilateral), a minimum of 188 patients per group is required according to the Z test with pooled variance. Assuming a dropout rate of 20%, 266 patients will be needed for each group. However, because of the limitations of recruitment, only 41 patients per group will be enrolled in the trial. Recruitment of participants is ongoing through newspapers, hospital outlets, and the hospital website according to the principle of voluntary participation. Interested patients can contact the principal investigator by their attending doctors via telephone, E-mail, or letter. They will then receive written information about the trial. After providing written informed consent, patients will be screened according to the inclusion and exclusion criteria. The enrolled patients will be equivalently assigned to two groups according to a random number table generated by SPSS 13.0 software (SPSS Inc., Chicago, IL, USA) 1 day prior to treatment. The randomization procedure will be completed by a doctor under interim arrangements. Because this is an open-label trial, all enrolled patients will be aware of their therapeutic schedules. Under high axillary brachial plexus or general anesthesia, patients will be asked to be supine on a "beach chair" with a pad positioned below the affected shoulder. An approximately 3-cm longitudinal incision will be made at the anterior one-third of the lateral deltoid followed by blunt separation of the deltoids until the rotator cuff and fracture site are reached, less than 5 cm below the acromion, to avoid axillary nerve injury. Initial reduction will be performed by traction, poking, and pushing assisted by C-arm X-ray, followed by temporary fixation using a Kirschner wire, to recover the neck-shaft angle and retroversion angle of the humeral head. An LCP with a proper length will be deeply implanted via the deltoid in close proximity to the periosteum and placed about 5 mm from the outer edge of the intertubercular sulcus and 5 mm below the major tubercle to avoid impinging upon the acromion. An approximately 2-cm longitudinal incision will then be made to expose the LCP and periosteum. C-arm X-ray review will be performed to ensure that fracture reduction and plate implantation and positioning are satisfactory, the implanted plate will be gradually fixed with locking nails (4-5 nails for the proximal fixation, and 3-4 nails for the distal fixation), and the Kirschner wire will be pulled out. Patients with severe medial bone defects of the humerus will undergo bone grafting using bone particles (Shanxi Aorui Biological Co., Ltd., Taiyuan, China), and patients with rotator cuff injury will undergo suture repair. During the operation, passive activity of the shoulder will be not limited in all directions. Finally, the incision will be sutured layer by layer, an indwelling tube will be placed for drainage, and sterile dressing will be applied. Patients in the test group will undergo temporary fixation using a Kirschner wire followed by conventional locking plate fixation. Details of the surgical procedures are the same as above. The Kirschner wire, conventional locking plate, LCP, and screws will be purchased from Xiamen Dabo Yingjing Medical Devices Co., Ltd., Xiamen, China. All products will be made of TC4 titanium alloy in line with GB/T13810-2007, with a colored and anodized surface followed by sterile packaging. All patients will be given routine prophylactic antibiotics 1 day postoperatively and receive functional training beginning at 2 days postoperatively with removal of the drainage tube. Patients will undergo passive shoulder exercises: pendulum-like motion, passive flexion, and external rotation exercises will be done first, and then passive rotation, adduction, and abduction exercises will be developed gradually. Once the fracture line becomes fuzzy on the X-ray review at 6 to 8 weeks postoperatively, patients will be immediately asked to carry out active functional exercises. Flexion, rotation, and adduction exercises will be strengthened gradually. Twelve weeks after the surgery, resistive exercises (upward, downward, outward, inward, upward and outward, downward and outward, upward and inward, and downward and inward) will be performed. During the rehabilitation training, patients with osteoporosis will be given anti-osteoporosis medication as follows: calcium carbonate (two tablets twice a day), calcitriol capsules (0.5 μg once a day), and salmon calcitonin nasal spray (100 U once a day). An overview of the time frame of the study is shown in [Figure 1]. Clinical outcome scores according to the Neer classification system (Ye et al., 2015) 6 months after surgery will be the primary outcome and will be used to assess shoulder function recovery. Overall scoring will comprise four aspects: function, range of activity, pain, and anatomical reduction. An overall score of > 90 is defined as excellent, 80 to 89 as good, 70 to 79 as fair, and < 70 as poor. According to the Neer classification system, the excellent rate is the percentage ratio of the number of excellent and good cases to the total number of cases. Intraoperative and postoperative general indicators: operation time (a shorter operation time indicates more rapid surgical progress), intraoperative blood loss (less blood loss indicates higher surgical quality), and postoperative hospital stay (a shorter postoperative hospital stay indicates more rapid fracture healing). Visual Analogue Scale scores at 1 and 3 days and 1 and 2 weeks after surgery to assess postoperative pain relief; the scale is scored from 0 to 10. A score of 0 is defined as no pain, 1 to 3 as mild pain, 4 to 6 as moderate pain, and 7 to 10 as sharp pain (Knop et al., 2001). X-ray examination 0.5, 1, 3, and 6 months after surgery. Disappearance of the fracture line shown on X-ray examination indicates fracture healing. Scores according to the Neer classification system at 0.5, 1, and 3 months after surgery to assess short-term recovery of shoulder function. Host responses to the implanted screw. The development of wound allergies, infection liquefaction, or screw loosening, shedding, or breakage within 6 months after surgery indicates poor biocompatibility of the screw with the host (Sommer et al., 2004). Scores of the Medical Outcomes Study 36-item Short Form Health Survey (SF-36) at 0.5, 1, 3, and 6 months after surgery. The SF-36 produces a score on a 0- to 100-point scale for each of eight dimensions: physiological function, role physical, bodily pain, general health, social functioning, vitality, role emotional, and mental health. A higher score indicates better quality of life (Laucis et al., 2015). The time schedule for the outcome assessment is shown in [Table 1]. Data collection: All data, including demographic information, disease diagnosis, concomitant diseases, allergic history (drug allergy), and adverse reactions, will be collected on a case report form and summarized in one form. These data will be recorded electronically using a double-data entry strategy by EpiData software. Data management: Only the project manager will have the right to query the database, and changes will not be allowed. All data relevant to this clinical trial will be preserved by the Affiliated Hospital of Qinghai University. Data analysis: All data will be statistically analyzed by professional statisticians. The statistical report by the statisticians will be given to the project manager responsible for writing the research report. An independent data monitoring committee will be in charge of data monitoring and management throughout the entire trial to ensure scientific accuracy, authenticity, and integrity. Open data: Published data will be released at http://www.figshare.com . The statistical analysis will be completed by statisticians using the SPSS 19.0 statistical software (IBM Corp., Armonk, NY, USA) in line with the intention-to-treat principle. Intergroup comparison for the excellent rate according to the Neer classification system will be performed using the chi-square test. The operation time, intraoperative blood loss, postoperative hospital stay, fracture healing time, visual analogue scale scores, and SF-36 scores will be compared using the Mann-Whitney U test. A value of P < 0.05 will be considered statistically significant. Predicted and unanticipated adverse events will be recorded during the trial. Adverse events including dizziness, fever, infection, subacromial impingement, humeral head necrosis, malunion, and severe pain will be detected. All serious adverse events will be recorded in detail, including the date of occurrence, type of event, and treatments, all of which will be reported to the project manager and institution review board within 24 hours. The progress of the trial will be reported to the ethics committee, and relevant data will be updated in the registration database. Two staff members will be responsible for transcribing the result data into a copy document and then dating and backing up this copy document into a specified computer. A result data table will be produced, checked, and locked by the investigators. The locked data will not be allowed to be changed and will be saved for future checking. No unauthorized personnel will query the database. All research data related to this clinical trial will be saved by the Affiliated Hospital of Qinghai University. We will analyze the therapeutic efficacy of LCP fixation using minimally invasive techniques on the recovery of shoulder function in older patients with proximal humerus fractures through a prospective, single-center, randomized controlled trial. Although our trial will enroll a larger sample (n = 41 per group) compared with previous studies (Wang et al., 2012), it still undermines the reliability of the trial. In this trial, we will observe the effects of LCP internal fixation on the fracture healing time, postoperative hospital stay, pain relief time, shoulder function, and quality of life in older patients with proximal humerus fractures. Compared with the conventional locking plate, the LCP can significantly minimize adverse effects on the recovery of shoulder function, making it an effective method for internal fixation of proximal humerus fractures in older patients. Overall, this trial will provide new insight into the repair of proximal humerus fractures in older patients. TW conceived and designed the trial procedure, as well as wrote the paper. GQZ read and approved the final version of the paper for publication. Biscević M, Hamzaoglu A, Ljuca F, Gavrankapetanović I, Nadarević A, Rejec-Smrke B, Smrke D (2009) Minimally invasive surgery of pathologic spine fractures-vertebroplasty and kyphoplasty at Department for Orthopedics and Traumatology of Clinical Centre University of Sarajevo. Med Arh 63:234-237. Den Hartog D, Van Lieshout EM, Tuinebreijer WE, Polinder S, Van Beeck EF, Breederveld RS, Bronkhorst MW, Eerenberg JP, Rhemrev S, Roerdink WH, Schraa G, Van der Vis HM, Van Thiel TP, Patka P, Nijs S, Schep NW (2011) Primary hemiarthroplasty versus conservative treatment for comminuted fractures of the proximal humerus in the elderly (ProCon): a multicenter randomized controlled trial. BMC Musculoskelet Disord 11:97. Fan Y, Li YW, Zhang HB, Liu JF, Han XM, Chang X, Weng XS, Lin J, Zhang BZ (2015) Management of humeral shaft fractures with intramedullary interlocking nail versus locking compression plate. Orthopedics 38:e825-829. Handoll HH, Brorson S (2015) Interventions for treating proximal humeral fractures in adults. Cochrane Database Syst Rev 11:CD000434. Hu WX, Jiang JZ, Han DH, Zhang HL, Xie WK (2016) Effect of medial column support reconstruction on limb function recovery in elderly patients with proximal humeral fractures. Shandong Yiyao 56:55-57. Knop C, Oeser M, Bastian L, Lange U, Zdichavsky M, Blauth M (2011) Development and validation of the Visual Analogue Scale (VAS) Spine Score. Unfallchirurg 104:488-497. Ma JW (2011) Locking plate in the treatment of proximal humeral fractures in elderly patients. Zhongguo Dangdai Yiyao 18:163-168. Min L, Tu CQ, Wang GL, Fang Y, Duan H, Liu L, Zhang H (2014) Internal fixation with headless compression screws and back buttress plate for treatment of old Hoffa fracture. Chin J Traumatol 17:79-83. Nakahara H, Kunisada T, Noda T, Ozaki T (2010) Minimally invasive plate osteosynthesis for osteofibrous dysplasia of the tibia: a case report. J Orthop Surg (Hong Kong) 18:374-377. Niemeyer P, Südkamp NP (2006) Principles and clinical application of the locking compression plate (LCP). Acta Chir Orthop Traumatol Cech 4:221-228. Pichon H, Chergaoui A, Jager S, Carpentier E, Jourdel F, Chaussard C, Saragaglia D (2008) Volar fixed angle plate LCP 3.5 for dorsally distal radius fracture. About 24 cases. Rev Chir Orthop Reparatrice Appar Mot 94:152-159. Qu F, Yuan B, Qi W, Li C, Shen X, Guo Q, Zhao G, Wang J, Li H, Lu X, Liu Y (2015) Arthroscopic fixation of comminuted glenoid fractures using cannulated screws and suture anchors. Medicine (Baltimore) 94:e1923. Solarz MK, Thoder JJ, Rehman S (2016) Management of major traumatic upper extremity amputations. Orthop Clin North Am 47:127-136. Sommer C, Babst R, Müller M, Hanson B (2004) Locking compression plate loosening and plate breakage: a report of four cases. J Orthop Trauma 18:571-577. Thayer MK, Vaidya R, Langfitt M, Carroll EA, Cannada LK (2015) Functional outcomes after both bone forearm fractures in adults. J Surg Orthop Adv 24:164-169. Wang JF, Song HB, Gu HJ, Ling ZD, Ma HH (2012) Case-control study on minimally invasive plate osteosynthesis for the treatment of proximal humeurs fractures in elderly patients. Zhongguo Gu Shang 25:487-489. Ye F, Zhu SB, Wang X, Li YZ, Wan L, Yang YB, Chen YS, Li JW (2015) Operative treatment for proximal humeral fracture with rotator cuff tear in elderly patients. Zhongguo Gu Shang 28:1111-1113. Zhao C (2015) Proximal humeral fractures in children choose different surgical methods. Zhonghua Yi Xue Za Zhi 95:2205-2207.